Systems Science in Metallurgic a l Proce ss, Wuhan University of Science and Technology, Wuhan, China. Received February 25th, 2011; revised April 6th, 2011; accepted April 24th, 2011.
functions of every firm is assumed to be known. tion will be readily available to the central authority . zed the problem in terms of a multilevel frame work . captured by a bilevel programming model . work are given in Section 5.
duce different productions and emit the same pollution. all the price acceptors in the competitive mar ket. tions are changeless in a relatively short period. demonstrate the feasibility of our model. 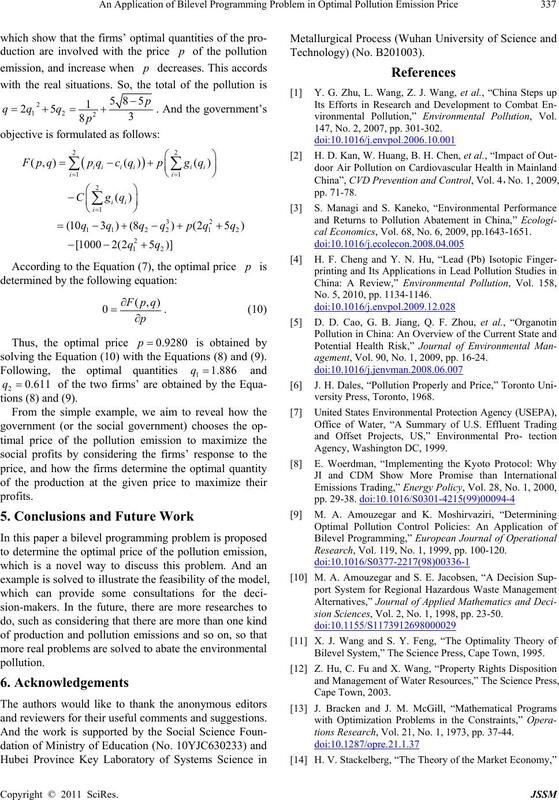 ernment chooses the price of the pollution emission. solving the Equation (10) with the Equations (8) and (9). and reviewers for their useful comments and suggestions. 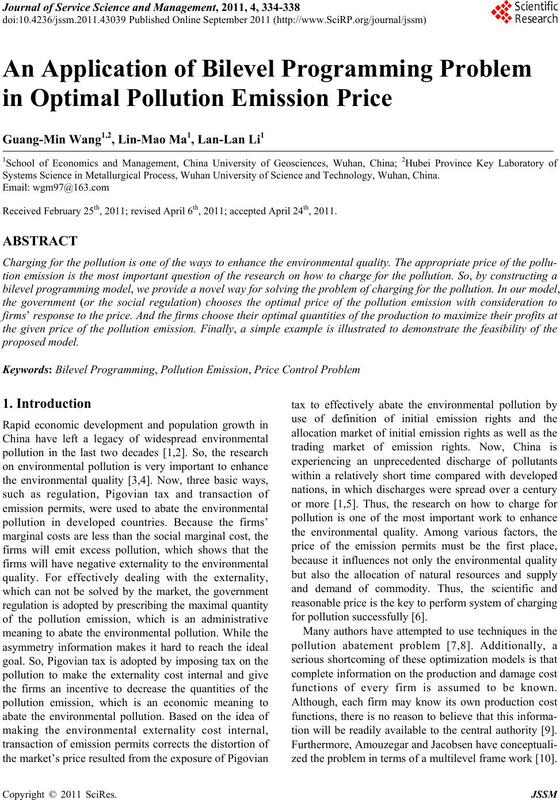 vironmental Pollution,” Environmental Pollution, Vol. 147, No. 2, 2007, pp. 301-302.
cal Economics, Vol. 68, No. 6, 2009, pp.1643-1651. No. 5, 2010, pp. 1134-1146.
agement, Vol. 90, No. 1, 2009, pp. 16-24. Research, Vol. 119, No. 1, 1999, pp. 100-120.
sion Sciences, Vol. 2, No. 1, 1998, pp. 23-50. 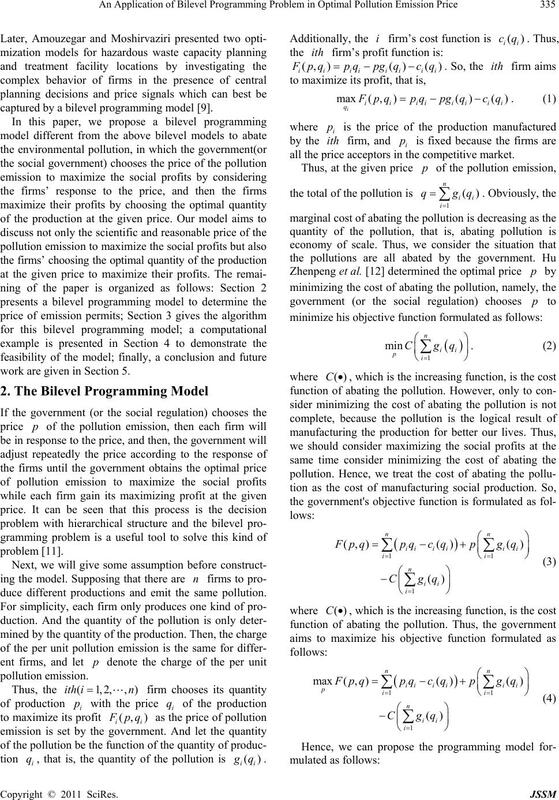 Bilevel System,” The Science Press, Cape Town, 1995.
tions Research, Vol. 21, No. 1, 1973, pp. 37-44. Oxford University Press, Oxford, 1952.
straints,” Optimization, Vol. 52, No. 3, 2003, pp. 333-359.
tions Research, Vol. 3, No. 2, 2005, pp.87-107. 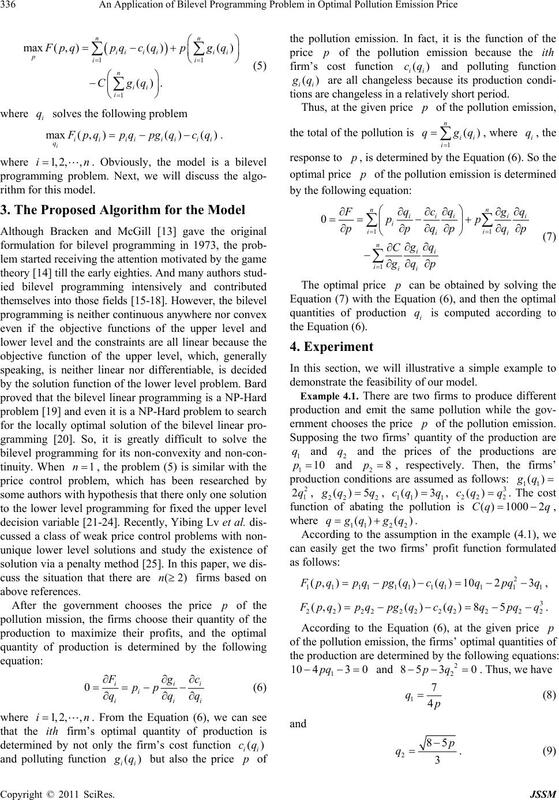 on Bilevel Programming,” Advances in Mathematics, Vol. 36, No. 5, 2007, pp. 513-529.
tions, Vol. 68, No. 2, 1991, pp. 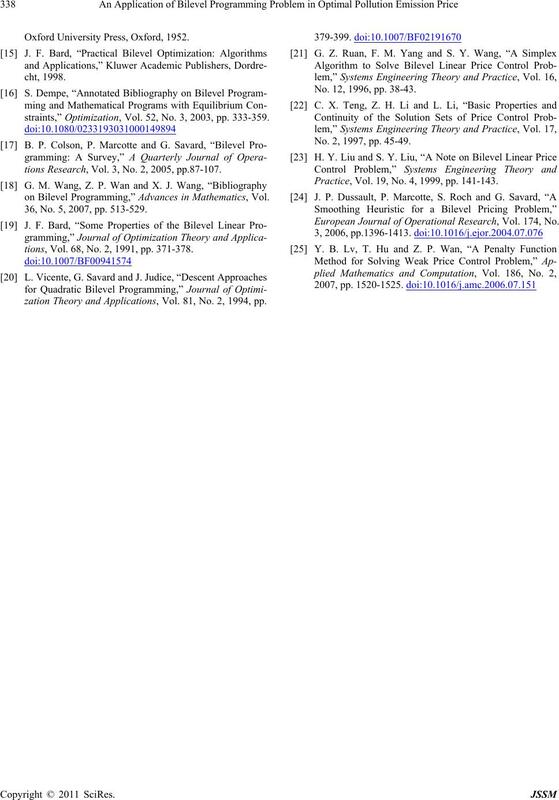 371-378.
zation Theory and Applications, Vol. 81, No. 2, 1994, pp. No. 12, 1996, pp. 38-43. No. 2, 1997, pp. 45-49. Practice, Vol. 19, No. 4, 1999, pp. 141-143. European Journal of Operational Research, Vol. 174, No.